Tomorrow afternoon we will celebrate my little one’s second birthday. Where in the world did two years go?? It seems like only yesterday that I was waddling around, anxiously awaiting his birth. And now he’s this tiny little man. So utterly perfect. I really love throwing birthday parties. There’s a good possibility that I actually enjoy throwing the party more than the kids enjoy celebrating the party. And with a little bit of thoughtful planning, I find it to be a relatively stress-free and enjoyable experience. In my opinion, a stress-free party is all about planning a menu which can be mostly prepared the day before and requires minimal fuss on the day off. I like dishes served cold or at room temperature or trays of food which can be reheated in the oven, while still maintaining their fresh taste and appearance. I avoid things like burgers, which need to be cooked in batches during the party and usually result in people standing around waiting for the platter to be refilled. I think burgers are great for barbecues, but for birthday parties, I like all the food to find its way to the table at the same time. Just my personal preference. I also like to vary our party menus so that there’s always something new for our guests to enjoy. 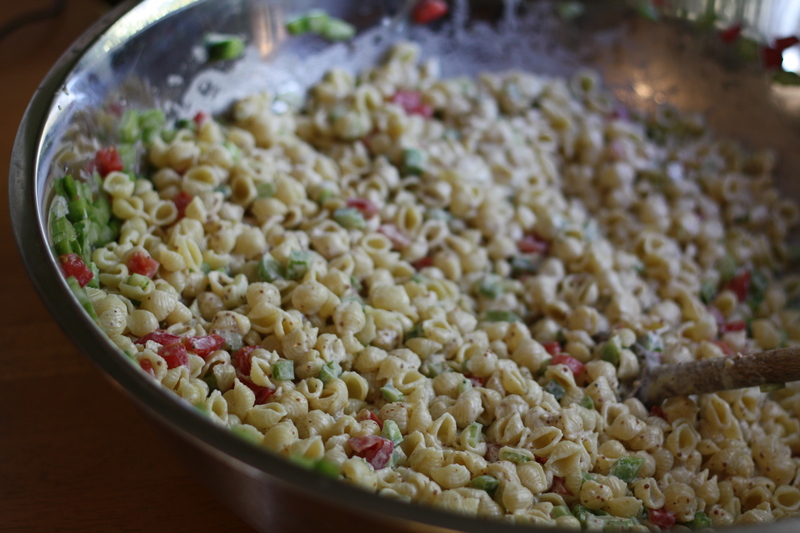 I’ve also got a few party standards, which I make again and again, like the Dinosaur Bar B Que Macaroni Salad. For this little fiesta, I’ll be serving an assortment of sandwiches and salads. Hopefully there will be a little something to delight everyone’s tastebuds. Today’s mission was simple. Prepare as much of the food as possible. I started with the Ambrosia Salad. Ambrosia is a childhood favorite of mine. Seriously, it’s hard to disappoint kids with a salad whose main ingredient is marshmallows. My Aunt Theresa is the queen of ambrosia, so I use her recipe, which couldn’t be simpler. There are no set measurements and it’s almost impossible to mess up. 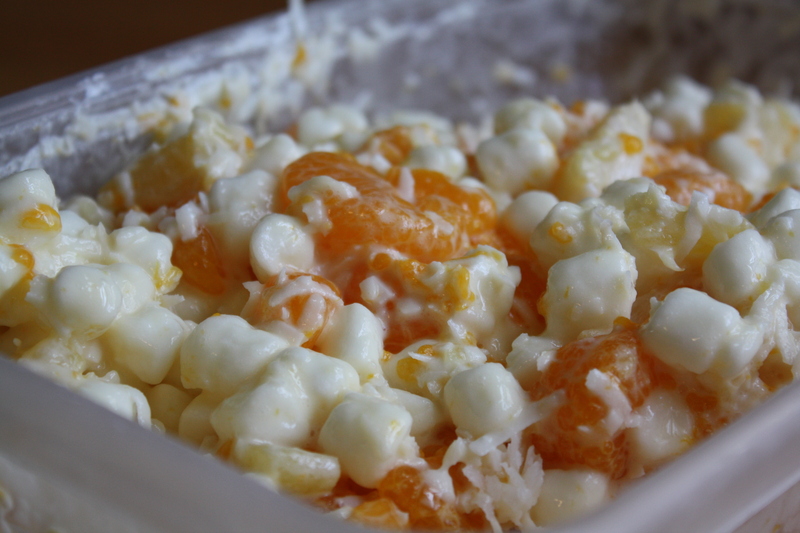 Simply mix a bag of mini marshmallows with a can or two of strained mandarin oranges and a can or two of strained pineapple tidbits. Then mix in about 1/2 cup of sour cream. If desired, throw in a cup of shredded coconut. Stir and refrigerate. 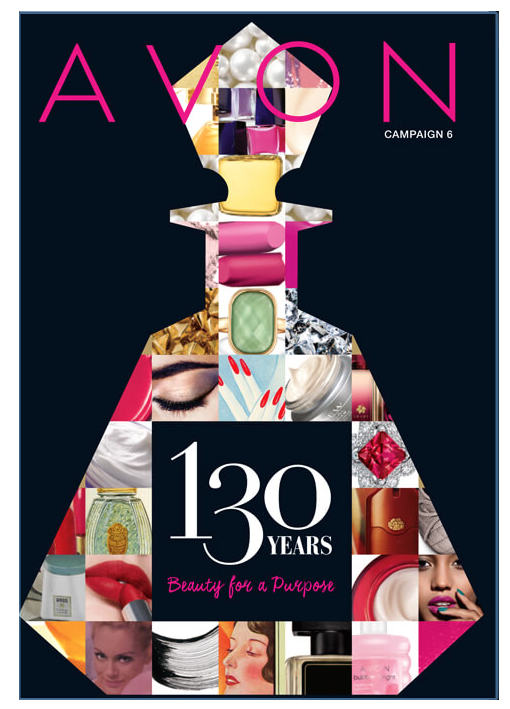 Make a few hours or a day ahead of time. If desired, garnish with marashino cherries. 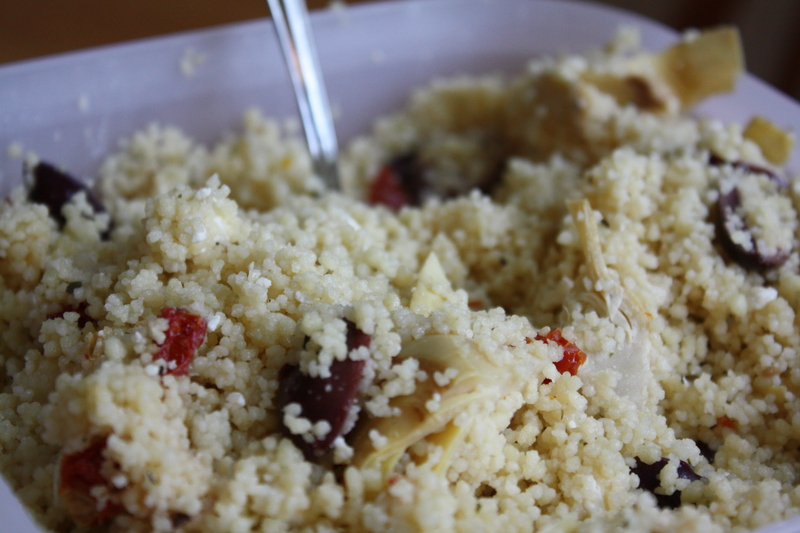 Next, I got to work on the Greek Couscous Salad, another simple and delicious side salad. Simply cook some couscous according to package directions. Allow it to cool for a few minutes. Then, I made a greek vinaigrette using lemon juice, red wine vinegar, olive oil, garlic, a bit of greek seasoning, salt and pepper. Toss the couscous in the dressing. 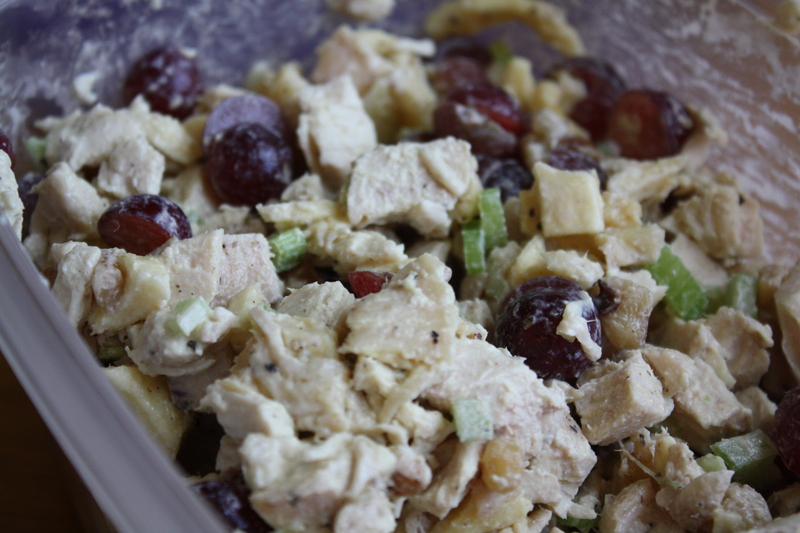 Throw in some crumbled feta cheese, chopped kalamata olives, marinated artichoke hearts, and sun-dried tomatoes. The macaroni salad is one of my recurring regulars. I use the Dinosaur Bar B Que recipe, found in their cookbook. As I’ve mentioned before, I have a bit of an aversion to mayonnaise. So, I tend to avoid salads dripping in mayo. 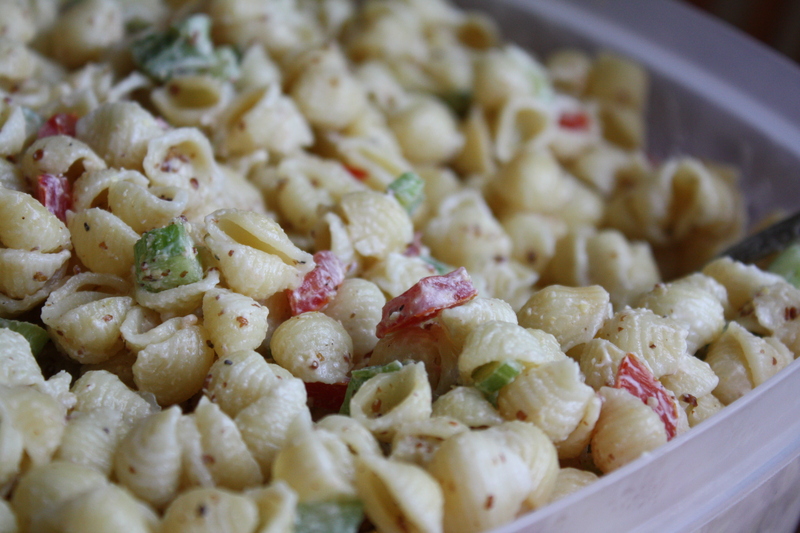 The Dinosaur recipe is hands-down my favorite macaroni salad, since it incorporates a good amount of creole mustard into the dressing, which cuts the mayo consistency. The flavor is fantastic! 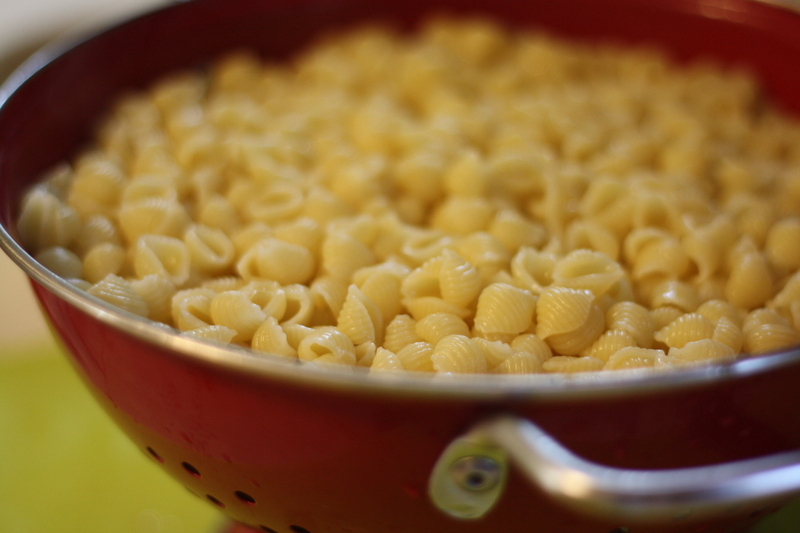 The salad starts with a pound of small pasta shells. Throw in some chopped celery, tomatoes, and green peppers. For the dressing, combine a cup of mayo (Hellmans, of course) with 1/4 cup of Creole Mustard. (I tend to add a bit more mustard). Add a teaspoon of brown sugar, 4 cloves of minced garlic, salt, and pepper. Toss the dressing with the pasta and veggies, then refrigerate to cool. My egg salad recipe couldn’t be simpler. Hard boil some eggs. Cool the eggs under cold running water. Remove the shells and cut the eggs in half. 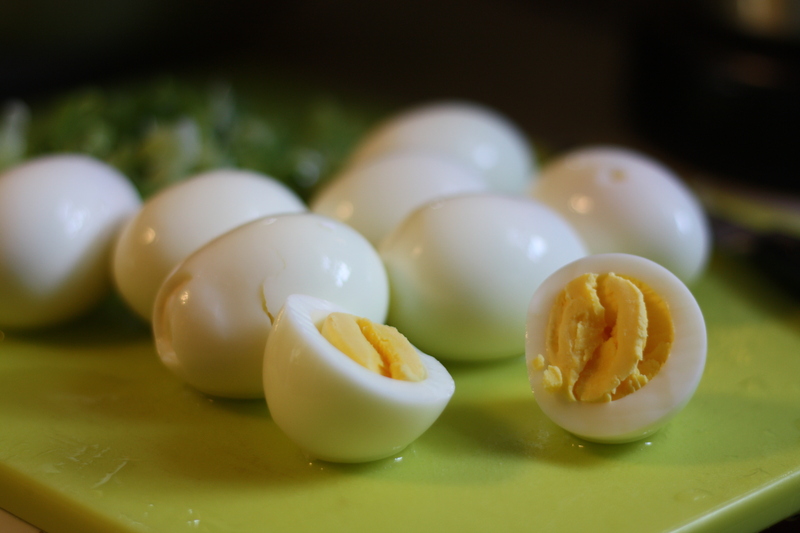 Remove the yolks and place in a bowl. Use a fork to crush the yolks. Combine with enough mayonnaise and mustard until creamy. Season with salt and pepper. Chop the egg whites and add to the bowl. 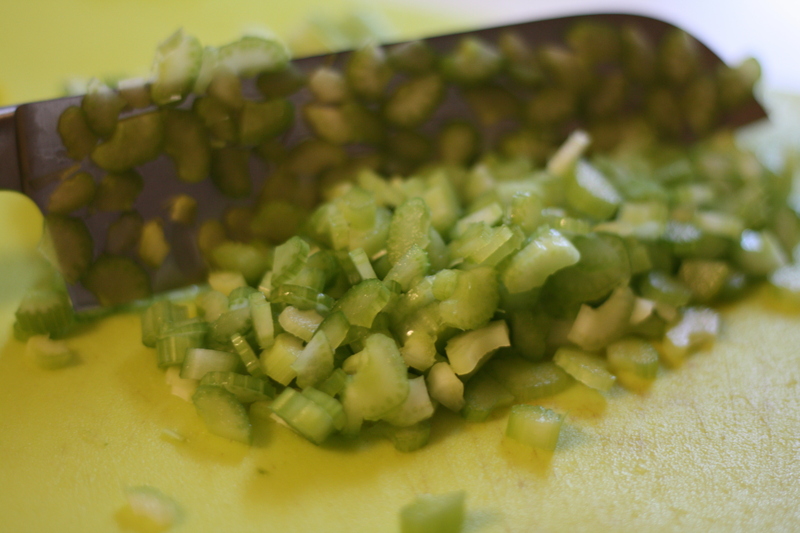 Slice a few green onions and add. Stir until well mixed. I prepared my recipe for Waldorf Chicken Salad, which you can find here and my Basil Pesto recipe, which you can find here. To keep things simple tomorrow, I also sliced the mozzarella and the figs and prepared the honey-mustard sauce, horseradish sauce, and gorgonzola cream for the sandwiches. For dessert, I baked my little guy a giant cupcake, using my favorite chocolate cake recipe, found here. 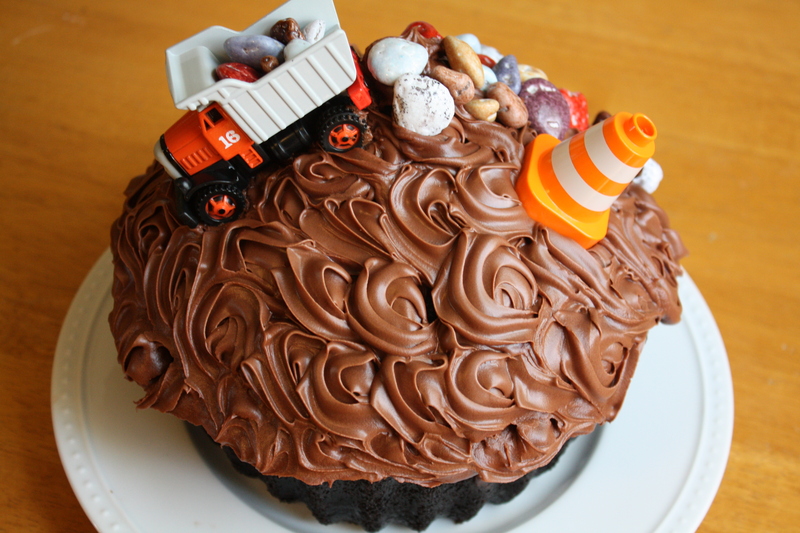 I decorated the top with a dumptruck and candy rocks, per his request. I made a double batch of the cake batter, so that I could bake some cupcakes. But, I way overfilled the cupcake pan, which caused the cakes to overflow. They began to fall apart when I tried to remove them from the pan. They were not in any condition for frosting. So, rather than waste the perfectly tasty cakes, I made Muddy Cups; a perfect addition to the Construction theme we’ve got going on. I stuffed the slightly mangled cupcakes into the bottom of small plastic cups. 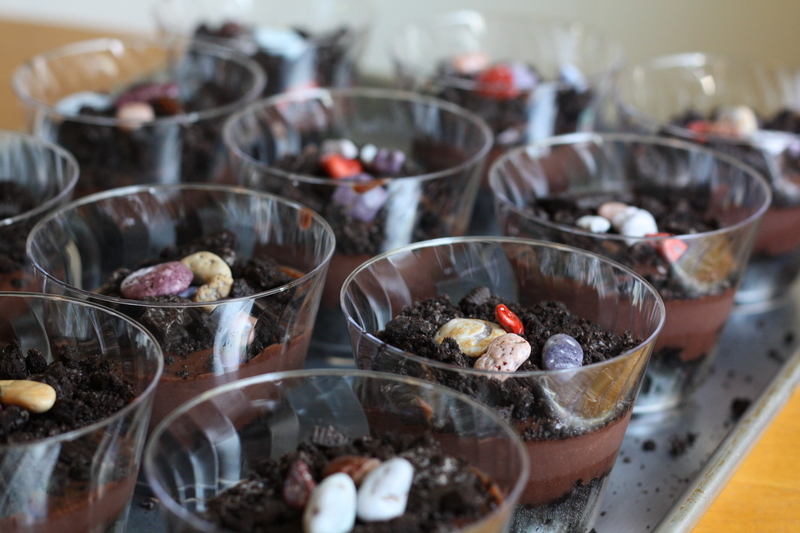 Then I covered them with a scoop of chocolate pudding and sprinkled them with crushed Oreos and candy rocks. 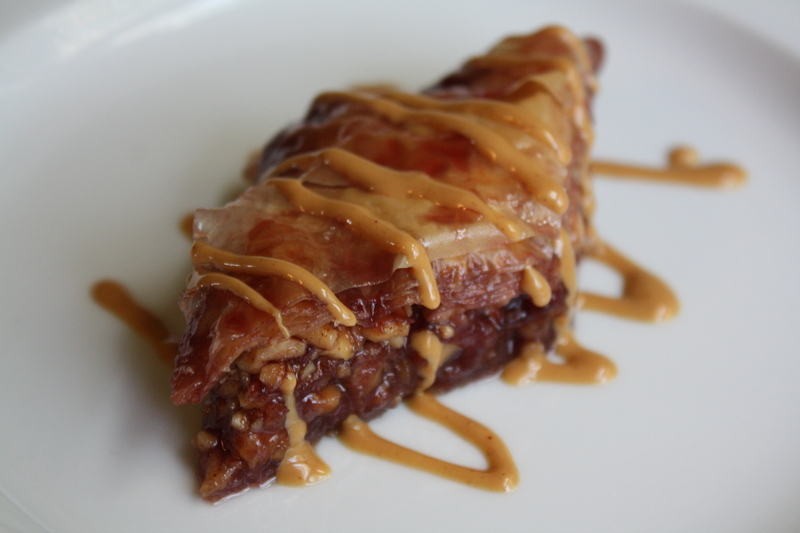 I’ll also be serving a Caramel Apple Cake and Peanut Butter and Jelly Baklava. Those recipes will follow at a later date. It was a productive day and we’re in good shape for tomorrow’s party. All that remains for tomorrow is composing the actual sandwiches, baking the Caramel Apple Cake, and decorating, of course! Should be a fun, stress-free, and tasty party! Posted in Cakes, Chocolate, Desserts, Dressings and Condiments, Eggs, Food, Main Course, Recipes, Salads, Sandwiches, Side Dishes, Vegetable and tagged birthday, Cooking, Food, food photography, party, pasta, Recipes, salad, sandwich, vegetables. Bookmark the permalink. You’re a genius. That’s all I’ve got to say about that. WOW, WOW and WOW. Also, happy birthday to your little man.